Stro "The Maestro of Wrestling"
STRO WRESTLING SCHOOL IS OPEN! The Stro is now accepting bookings. To book The Stro, please email Stro Enterprises by either Stro at stro4ya@yahoo.com or Bambi Weavil at bambi.weavil@outimpactproductions.com. Watch upcoming movie trailers "12-24" and "Deader Country" starring the Stro! Congradulations to the Stro for ranking 417 in this year's 2009 PWI Top 500 wrestlers in the world! 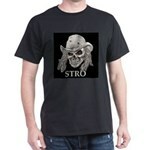 New Stro t-shirts on sale now! New Stro Sigg Water Bottles! The official trailer to the upcoming movie "12-24" starring Tiffany Shepis, Devanny Pinn, and the Stro! The poster is out now for one of Stro's upcoming horror movies for 2009 entitled "Deader Country"
Enjoy your stay, and thanks for visiting!